I had the pleasure of being a Course Assistant (CA) for Psych 1 (the introductory Psych course) during Winter quarter, 2007. A CA is basically a TA, only the Psych department, for some damned reason, won't call us TA's. The Biology department, for example, calls people in our position TA's, but the Psy... ok, forget it. Anyway, we got our own section of ~25 students that we met with in a classroom once a week. During that time we participated in activities we designed and went over the material. We graded two assigned essays during the quarter (harder than I thought it would be! ), led review sessions before each of the 3 exams, and proctored those exams. 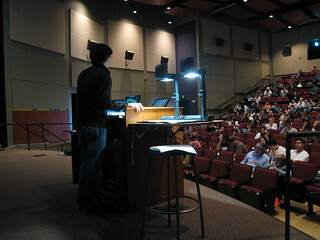 We also attended every lecture and met with the other CA's and our supervising TA in a three-hour meeting every week. It was a tremendous amount of work and a whole lot of fun. This is me going over visual cognition before Exam 1, which covered the cognitive psychology portion of the course. I did plenty of "Comedy Sportz" (theater games, improv games) and even helped MC a couple of events in front of big crowds in high school, but I have never spoken to so many people since or otherwise. Communicating clearly and motivating the audience to ask me meaningful questions was tough but very exciting. I wouldn't mind doing this more often or even daily. Helping teach this course was an amazing experience that I highly recommend.